Home / Experience ‘A Maze’ from 17th – 22nd of April during Fuorisalone, in Via Tortona 14! 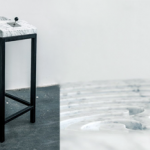 „A Maze“ is the world’s first both analogue and electric gaming console in marble. Steer the ball through the maze with a thought-out mechanism. This game device removes the boundary between space and time for the user. Two points that are closest to each other in the maze can be simultaneously separated from each other by the entire length of the maze. „A Maze“ playfully illustrates the complexity of the space-time continuum and makes it understandable and tangible. Labyrinths, in the classical sense, have no wrong turns and lead around the goal until you finally reach it. „A Maze“, though has no goal. The labyrinth is made up of seven concentric rings that are linked together in such a way that there is no end and therefore no beginning. The number seven is of great importance, because the seven is considered a mystical number but also plays an important role in our psyche and in our daily lives. For one thing, our lives are focused on a 7-day week, and we have „Miller’s number Seven +/- 2” in memory psychology. Miller’s number explains that we can only keep 7 chunks of information simultaneously in our short term memory. There is so much more to „A Maze“, with the concept of seven shaping the labyrinth itself, than could be put across by this brief introductory text.